J&K Bank Inter Net Banking Online Registration for New Individual Self user apply online at www.jkbank.net and www.jkbankonline.com…..
Jammu and Kashmir Bank is one of the localized and authorized bank in our Country. Jammu and Kashmir Bank is shortly named as J&K Bank. JK Bank Internet Banking Online Registration is a good facility provided by J&K Officials. Actually lot of customers are ready to open JK Bank Net Banking for New Individual user. In previous articles we clearly give a brief guide on other Banks Internet Banking Online Registration. 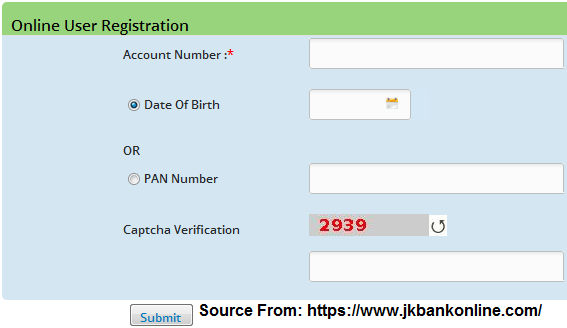 In this post we will explain J&K Bank Online Internet Banking Registration. Actually by using this facility everyone can transfer or sending money to other banks also using NEFT / RTGS / IMPS. RTGS will accept minimum 2lakhs for transferring the amount to other banks. IMPS will be applicable upto 2lakhs only. So more than Rs.2,00,000/- by transferring through RTGS only. JK Bank also provide another facility to the lovely customers i.e JK Mobile Banking. After the explanation completion of JK Bank Internet Banking Online Registration we will discuss about on Mobile Banking or SMS Banking. After you can see Online Registration Form. In that form you can write your Bank Account Number, Date of Birth, Pan Card Number and Captcha. Click on Submit Button. In the next page you can write your Debit Card Number, Expiry Date, CVV and ATM Pin. If the debit card details will be match to your account then you can go to the next steps. In the another page you can choose your Login Credentials. Click on Submit Button. You can get an One Time Password to your Registered Mobile. Type in the OTP box click on submit button. That’s it your registration successfully completed. After 24 hours / 48 hours your user id will be completely activated successfully. J&K Bank Mobile Banking: Actually it is the good news for JK Bank Customers who are carrying smartphones like Android or iPhone users can download the “J&K Bank mPAY” Application in your mobile phone. You can use on your hands free.